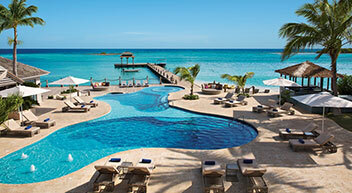 Save $200 on packages of up to $3,000. Save $300 on packages of $3,001 – $4,499. Save $400 on packages of $4,500 or more. Hotel offer blackout dates include: 1/11/19 – 6/7/19. Want to getaway this holiday season? These savings are valid for travel through 1/10/19—get them before they’re gone! Hotel offer blackout dates: 3/31/19 – 6/7/19. RiuLand kids' club and playground. Free airport transfers included in Diamond Club™ room categories. Free airport transfer offer blackout dates: 1/1/19 – 6/7/19. *Up to $400 per reservation promotion code savings apply on flight + hotel vacation packages to Mexico or the Caribbean (excluding San Juan (SJU) and Mexico City (MEX). Save $200 on packages totaling up to $3,000; Save $300 on packages totaling $3,001 – $4,499; Save $400 on packages totaling $4,500 or more. Savings is reflected in the package price when using promotion code INT400 at the time of booking and is based on total package price before discount is applied. Length of stay for flight and hotel components must match. Promotion code intended for redemption by individual consumer only. One-day advance purchase is required. Savings valid if booked 11/5/18 from 12:00 a.m. CT – 11/8/18 by 11:59 p.m. CT for travel 11/6/18 – 6/7/19. Spa treatment coupons: Guest can apply $100 worth of coupons towards spa treatments as follows: two coupons worth $40 and one coupon worth $20. Only one coupon may be redeemed per spa treatment. Romantic dining experience coupons: Guest can apply $60 worth of coupons towards a romantic dining experience as follows: one $40 coupon and one $20 coupon may be combined, resulting in a total discount of $60 off one romantic dining experience. Wine purchase coupons: Guest can apply $40 worth of coupons towards wine purchases as follows: when using coupons towards wine purchases, only coupons worth $10 may be used and cannot be combined; therefore one $10 coupon can be applied towards the purchase of one bottle of wine. Resort coupons cannot be applied toward the following items: beauty salon services, spa product purchases, telephone charges, dolphin experiences, gift shop purchases, boutique purchases, internet service (where applicable), marina services, dive shop, medical services, car rentals, or travel agency services. 2Get $600 in resort credit in Diamond Club™ room categories or $300 in non-Diamond Club room categories. Use your resort credits towards items such as room upgrades at the time of check-in, wine purchases, and the Royal Spa. Additional details will be provided upon hotel check-in. 4$35 spa coupon can be applied towards the purchase of an 80-minute Renova Combination massage. Offer is valid per adult, per stay. For travel 11/6/18 – 12/23/18: Stay four to six nights and get up to $1,320 in resort coupons. Stay seven or more nights and get up to $2,140 in resort coupons. For travel 12/24/18 – 6/7/19: Stay four to six nights and get up to $1,335 in resort coupons. Stay seven nights or more and get up to $2,190 in resort coupons. For travel 11/6/18 – 12/23/18: Stay four to six nights and get up to $460 in resort coupons. Stay seven or more nights and get up to $590 in resort coupons. For travel 12/24/18 – 6/7/19: Stay four to six nights and get up to $470 in resort coupons. Stay seven nights or more and get up to $600 in resort coupons. For travel 11/6/18 – 12/23/18: Stay four to six nights and get up to $680 in resort coupons. Stay seven or more nights and get up to $780 in resort coupons. For travel 12/24/18 – 6/7/19: Stay four to six nights and get up to $700 in resort coupons. Stay seven nights or more and get up to $800 in resort coupons.